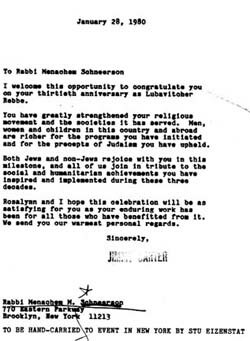 The Rebbe’s long-term influence and involvement in U.S. policies was primarily to serve the interests of education. 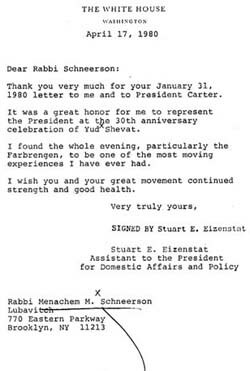 The Rebbe, Rabbi Menachem Mendel Schneerson, of righteous memory, constantly addressed presidents, lawmakers and cabinet members about their obligation to educate children to be ethical and just citizens. 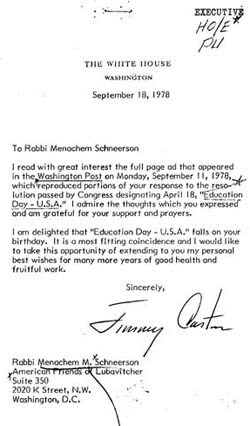 President Jimmy Carter designated April 18, 1978, the secular date on which the Rebbe’s Jewish birthday, the 11th of Nissan, fell that year, as “Education Day U.S.A.” Every year since, the acting president has designated the anniversary of the Rebbe’s birth as a day dedicated to educational awareness. Here are the primary documents of the proclamations, correspondence and the Rebbe’s talks about the importance of Education Day U.S.A. Most deserving of our very profound appreciation is one of the most meaningful actions by the U.S. Congress who, in a joint resolution, carried by a two-thirds majority in the House of Representatives and by unanimous vote in the Senate, authorized and requested the President of the United States to proclaim this day as "Education Day, USA," which the President graciously signed into law. While the timing of this action was conceived as a tribute to our movement, which sees in education the cornerstone not only of Jewish life, but of humanity at large, and has been dedicated to this vital cause ever since its inception more than two hundred years ago—it is a fitting and timely tribute to the cause of education in general, focusing attention on what is surely one of the Nation's top priorities. It is fitting indeed that the U.S.A. has shown, through a forceful example to the world, that it places education among its foremost priorities. 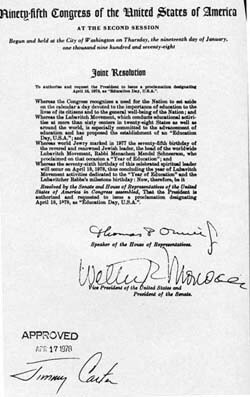 It is also to be hoped that "Education Day" will become a permanent institution, especially since, by reason of the pervasive nature of education, it would lend further significance to other "Days" such as Father's Day and Mother's Day and similar institutions which have become part of American life. The proclamation of "Education Day, USA" is of extraordinary significance in impressing upon citizens the importance of education, both in their own lives as well as, and even more so, for the young generation in the formative years—particularly in the present day and age. We have now concluded the "Year of Education" proclaimed last year on this day. This calls for review and introspection. In all humility we can say that with G‑d's help it has been a very successful year for education, with the addition of numerous educational facilities on all levels in the U.S.A. and in many parts of the world; a substantially increased enrollment; and upgrading the quality of education. However, needless to say, as long as there is still one child that does not receive an adequate education, we can neither be satisfied nor slacken our efforts. On the contrary, the successful "Education Campaign" should spur us to even greater efforts in the ensuing year. It is human nature that ambition grows with achievement. If this is so in regard to material riches, how much more so in regard to real and eternal values. Moreover, since this trait of the human nature to strive for ever greater spiritual advancement has been given to every human being by the Creator, as a commendable factor, it is self understood that the Creator provides, at the same time, the capability and opportunities to translate it into tangible results, for "G‑d requests of people only according to their powers (that He has given them). "1 Thus, in the final analysis, it is mainly a matter of one's own will and determination. And let no one be satisfied with just a little greater effort for the cause of education, but—in keeping fully with human nature as cited above—double and redouble one's efforts for so vital a cause. Education must put greater emphasis on the promotion of fundamental human rights and obligations of justice and morality, which are the basis of any human society, if it is to be truly human and not turn into a jungle. The United States of America has a long-standing policy of foreign aid to developing countries, through direct grants and through U.N. agencies. Economic aid to foreign countries includes also cultural aid for the promotion and support of cultural programs, etc. It is generally recognized, at any rate among the free and democratic nations, that each nation is a member of the Family of nations, and all must live together in "the world" which is like one organism. When any part of an organism ails, it affects the whole body; strengthening any part of the body strengthens the whole. The record of this Nation's foreign aid is unexcelled in the annals of history, which is as it should be for a Nation so generously blessed by the Al-mighty. One would wish, however, for more affirmative action in the area of cultural, particularly educational, programs. Economic aid given to a developing country is meant to be used most efficiently and productively. While the conditions attached to such aid must necessarily be limited and circumspect, there are certain conditions which are considered prerequisites. To cite a recent example, President Carter has taken a courageous stand on Human Rights, dismissing the notion that it is an "internal matter," and he has made it also a condition of Foreign Aid. It is to the President's credit that he has not only raised this issue, but has succeeded in arousing the world's "interest" in behalf of this cause. "Unofficially," however, there is a great deal more that the U.S. government can do to make foreign aid even more productive. This Nation, with a healthy intuition, indeed, conviction, recognized that its economic system must not be based on crass materialism. Nothing expresses this idea more eloquently and forcefully than the motto on the American Dollar—"In G‑d We Trust." In giving out billions of dollars in foreign aid, many discreet ways can be found to have the beneficiaries take a look and ponder on this inscription, with a view to encouraging them to recognize the importance of Trust in G‑d, of appropriate education, with particular emphasis on moral values and genera, humanitarian principles, as mentioned above. Carrying this train of thought further brings us also to the question of military aid. Ideally, education should lead to a world state where "Nation shall not lift up sword against Nation, neither shall they train for war. "2 Until such an ideal state is reached, there will be a need—in the Nation's own interest—to provide friendly, democratic nations with military aid for self defense, but not to provide military aid to nations that will use it to start war. It would surely be in the best interests of those countries themselves, as well as of the United States and the world at large, if, instead, goodwill and benevolence towards them were expressed in terms of economic and cultural aid, to help them raise a new generation free from hatred and violence and bent on channeling their youthful energies and ambitions towards all that is good, good for them and for their countries, and the common good of humanity both materially and spiritually. 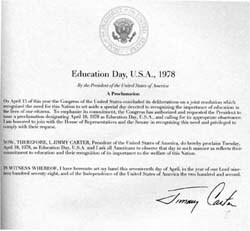 In light of all that has been said above, it is most gratifying indeed that President Carter, Vice-President Mondale, and the eminent members of the United States Congress, G‑d bless each and all of them, have thoughtfully and graciously initiated and associated themselves with the Proclamation of "Education Day, U.S.A." It augurs well for the vital cause of education in the United States. It will, we hope and pray, also have a beneficial impact on education in all countries which look up to the United States of America for leadership and inspiration in all vital matters that transcend national boundaries, and conduce to a better human society and a better world. I read with great interest the full page ad that appeared in the Washington Post on Monday, September 11, 1978, which reproduced portions of your response to the resolution passed by Congress designating April 18, "Education Day - U.S.A." I admire the thoughts which you expressed—and am grateful for your support and prayers. I am delighted that "Education Day - U.S.A." falls on your birthday. It is a most fitting coincidence and I would like to take this opportunity of extending to you my personal best wishes for many more years of good health and fruitful work. I am honored and deeply gratified to receive your kind and thoughtful letter of September 18, 1978. I particularly appreciate your laudatory reference to the resolution passed by Congress designating April 18 as "Education Day - U.S.A." Your personal interest in the cause of Education, coupled with the influence of your exalted position, goes a long way in promoting the vital importance of Education in general, and is a source of further encouragement to the dedicated activities of the movement which I am privileged to head. It is also in behalf of our movement, no less than in my own behalf, that I gratefully welcome your warm sentiments and good wishes. At the appropriate occasion I will take the liberty of quoting your letter, for which I trust I have your permission in the public interest. In this solemn season of our Jewish Calendar, on the threshold of the New Year 5739, I extend to you and to the First Lady and all your esteemed family prayerful wishes for good health and prosperity and the fullest measure of achievement in your most exalted position. I am pleased to join your family and friends in sending you my warmest congratulations on your 50th wedding anniversary. May love and devotion continue to bless your marriage. In light of your gracious letter of September 18, l978, with reference to the resolution passed by Congress designating April l8, "Education Day - U.S.A." which you signed into law, it will come as no surprise to you, Mr. President, that your proposal to establish a Cabinet-level Department of Education has received my fullest endorsement and acclaim. This was one of the main topics of my public address on the occasion of the annual observance of the Yahrzeit of my saintly predecessor on the 10th of Shevat. At the same time I expressed my ardent hope that not only will the proposal be expeditiously acted upon by Congress, but that governments of other nations will emulate your example. For, although some countries already have a separate Department of Education, there are those that have not, and all those where education has still to be placed as a top national priority. I am, of course, referring to education in a broader and deeper sense—not merely as a process of imparting knowledge and training for a "better living," but for a "better life," with due emphasis on character building and moral and ethical values. Indeed, the U.S. government, and you Mr. President personally, are in a unique position of influence among the nations of the world, particularly those benefiting from U.S. economic, cultural and other forms of aid, to encourage them to follow your example and to share your "conviction that the noblest task of government is education"--to quote your statement (2/28/78)--a conviction which has been translated into bold, comprehensive action. I am confident that the response will be positive, and I venture to say that it would have a favorable feedback impact on those in this country who, for one reason or another, are not, as yet, enthusiastic about Congress legislation on the submitted project. I read with profound interest your Remarks at Meeting of Ad Hoc Committee For a Cabinet Department of Education, Jan. 24, l979. Needless to say, I fully endorse the substance and urgency of your message. Indeed, in light of the saying of our Sages, "Words coming from the heart penetrate the heart and are eventually effective," I am confident, Mr. Vice-President, that your words will find the proper response they deserve. Education, in general, should not be limited to the acquisition of knowledge and preparation for a career, or in common parlance. "to make a better living!" We must think in terms of a "better life," not only for the individual, but also for society as a whole. The educational system must, therefore, pay more attention, indeed, the main attention, to the building of character, with emphasis on moral and ethical values. I submit, therefore, that the Administration's resolve to restructure the Federal education role—long overdue—would be well served if it were coupled with greater emphasis on the objective of improving the quality of education in terms of moral and ethical values and character building that should be reflected in the actual everyday life of our young and growing generation. 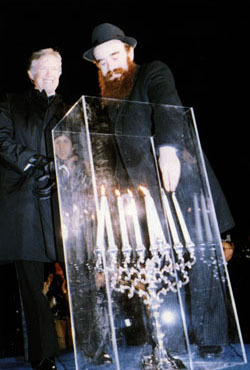 President Jimmy Carter at the Lubavitch Menorah Lighting in front of the White House together with Rabbi Abraham Shemtov, national director of American Friends of Lubavitch and the Rebbe's ambassador to the White House. On December 17, 1979, during the Iran hostage crisis, the President attended the lighting of the National Menorah in front of the White House, sponsored by American Friends of Lubavitch. It was his first appearance since the crisis. Here are his remarks. It's a real honor for me to come from the White House here to this ceremony celebrating the commencement of Chanukah, last night, the Festival of Lights. As many of you know, the season of Chanukah commemorates the victory of religious freedom. At the commencement of the celebration of this annual event, this season of thanksgiving and closeness to G‑d, there was a miracle within which the candle which was supposed to only burn a short time burned for 8 days and nights. This miracle showed that G‑d meets our needs. If we depend on Him, He will meet our needs. This also shows that there is a need to celebrate courage and to remember that hope in one's breast need never die. This season, religious season, commemorates the perpetuation of age-old dreams and the hunger of men and women down through the ages to maintain a spirit committed to life under the most difficult circumstances, the most difficult persecutions, the most difficult dangers, and under the most difficult suffering. It also commemorates humankind's commitment to be free. These commitments to live and to be free are ever present these days in the minds and hearts of all Americans, because we know that 50 of our fellow human beings, our fellow citizens, are not free and they want to live. We pray that this will prevail, this desire to be free and to maintain life. The first candle that I lit, the shammes candle, has given its light now in this glass cage to five other candles. It has not itself been diminished. It shows that when we give life and love to others, the life and love in our own hearts is not diminished. As a matter of fact it grows the more we share it. So, tonight we pray that our closeness to G‑d, our memory of these fine commitments of human beings down through the ages will strengthen our desires to share our life and our love, not only with the 50 American hostages, for whom we pray constantly, but for men and women throughout the world who don't always have freedom and whose lives might be in danger. I'm very grateful that this beautiful menorah has been dedicated for the commemoration of the season of Chanukah, and I'm very grateful as President to be partaking in this commemoration of a season when human beings are drawn closer to G‑d and, in that spirit, have confidence that the future will bring us a better life with G‑d and with one another. 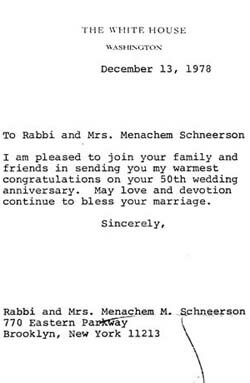 I welcome this opportunity to congratulate you on your thirtieth anniversary as Lubavitcher Rebbe. You have greatly strengthened your religious movement and the societies it has served. Men, women and children in this country and abroad are richer for the programs you have initiated and for the precepts of Judaism you have upheld. Both Jews and non-Jews rejoice with you in this milestone, and all of us join in tribute to the social and humanitarian achievements you have inspired and implemented during these three decades. Roselyn and I hope this celebration will be as satisfying for you as your enduring work has been for all those who have benefited from it. We send you our warmest personal regards. It was a distinct pleasure to see you and greet you personally at the thirtieth anniversary celebration of Yud Shevat. I was also deeply gratified on being informed of the very impressive address you delivered at the dinner reception preceding the Farbrengen in tribute to our Lubavitch movement before that distinguished audience. I sincerely appreciate your warm sentiments and good wishes, which I can best reciprocate by reiterating the dictum of our Sages, "He who blesses others is blessed by G‑d Himself. Accordingly, may you and yours be blessed out of His full, open, holy, and ample Hand," in a most generous measure, materially and spiritually. 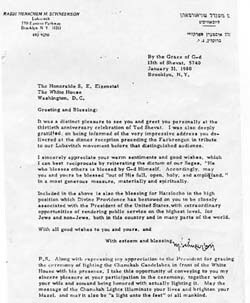 Included in the above is also the blessing for Hatzlocho in the high position which Divine Providence has bestowed on you to be closely associated with the President of the United States, with extraordinary opportunities of rendering public service on the highest level, for Jews and non-Jews, both in this country and in many parts of the world. P.S. Along with expressing my appreciation to the President for gracing the ceremony of lighting the Chanukah Candelabra in front of the White House with his presence, I take this opportunity of conveying to you my sincere pleasure at your participation in the ceremony, together with your wife and sons and being honored with actually lighting it. May the message of the Chanukah Lights illuminate your lives and brighten your mazel, and may it also be "a light unto the feet" of all mankind. 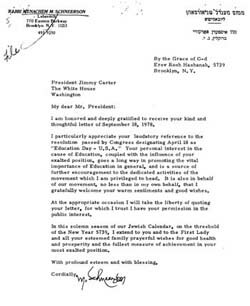 Thank you very much for your January 31, 1980, letter to me and to President Carter. It was a great honor for me to represent the President at the 30th anniversary celebration of Yud Shevat. I found the whole evening, particularly the Farbrengen, to be one of the most moving experiences I have ever had. I wish you and your great movement continued strength and good health.